US stunt to salvage tenuous regional dominion faces Pakistani-Chinese ire. Bangkok, Thailand May 5, 2011 - The immediate reaction by most across the world upon hearing of "Bin Laden's" death was that America now had the excuse it needed, real or not, to gracefully depart from its disastrous "War on Terror." However, the architects behind America's foreign military adventures over the past several decades have already begun clamoring about the need to not only expand their global war, but to implicate Pakistan as being complicit in harboring the mythological "Bin Laden." An Offer Pakistan "Can't Refuse"
Brookings Institution, and in particular, the policy wonks that penned the treasonous, extralegal, extraterritorial "Which Path to Persia?" report, are busy handing Pakistan "an offer it can't refuse" on the heels of this obvious hoax. One such wonk, Michael E. O'Hanlon of Brookings recently wrote, "U.S.-Pakistan: Bad Union, No Divorce" where he outlines a series of "incentives" to coax Pakistan back down the road of serving America's regional interests. Somehow, free-trade deals, the promise of reduced drone attacks, and more unsolicited aid is supposed to convince Pakistan to acquiesce to American demands in the wake of this recent, intentional frame up of their populous South Asian country. Citing the cartoonish "bin laden" hoax, where the long-dead elusive CIA asset has now been "killed" down the street from Pakistan's military academy, Pakistan is expected to acquiesceto numerous demands and concessions from the US. Such demands being placed upon Pakistan, according to O'Hanlon, involve scaling back Pakistan's nuclear program, reducing Pakistan's unilateral relations with neighboring Afghanistan, and of course America's continued free reign within Pakistani territhttp://www.blogger.com/img/blank.gifory itself. In other words, the complete relinquishing of Pakistan's national sovereignty to a foreign power in exchange for less brutality, less engineered destabilization, and diminished economic independence. US Insistence that Pakistan's Concerns are "Paranoia"
Fellow "Which Path to Persia?" author Bruce Riedel of Brookings weighs in with his piece, "Pakistan Plays Hardball" published in Newsweek. Concerning is the level of intellectual dishonesty Riedel laces this piece with, as he convinces readers that Pakistan's paranoia toward American interests in the region is unwarranted. 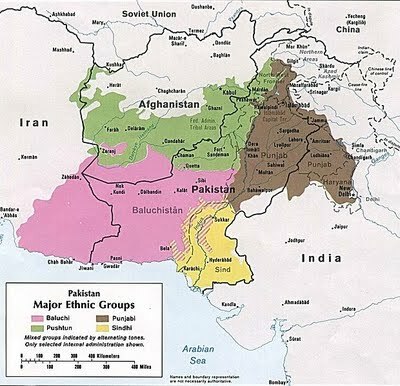 Brookings' Bruce Riedel calls Pakistan "paranoid" even as fellow policy wonks openly call for the carving up of the country - in particular the "liberation" of the Baluchi region (in pink). Riedel might want to revisit his work in "Which Path to Persia?" to see where this very warranted suspicion comes from, as the report openly recommends the use of foreign-funded revolutions, armed insurrections, and military coups in tandem to force concessions or even regime change in target nations. Similar calls have been made specifically in regards to carving up Pakistan. Riedel for his part, seems to suggest toward the end of his piece that once again, manipulating Pakistan's political scene would be the best method to rein in an increasingly defiant Pakistan. Fellow corporate-financier policy wonk Selig Harrison of the Soros-funded Center for International Policy, openly called for the carving up of Pakistan in two reports earlier this year. He explicitly calls to "aid the 6 million Baluch insurgents fighting for independence from Pakistan in the face of growing ISI repression." This further justifies Pakistan's growing suspicion and defiance while it undermines Western accusations of unwarranted paranoia. Harrison specifically mentions China's growing influence in Pakistan and how it is undermining America's interests throughout the region. Coupled with O'Hanlon's belief that a similar scenario is playing out in Afghanistan where Kabul is slowly slipping out from under US influence with Pakistan's help, brings to light the deterioration of the West's regional agenda. This signifies not just a failure in Afghanistan and Pakistan, but an overall, irreversible failure to contain China as part of the "String of Pearls" strategy. Such a failure becoming apparent might be a good reason why the West has decided to "find" Bin Laden all the sudden in the heart of Pakistan's military and intelligence community. An anonymous opinion piece in the Boston Globe calls for the extortion of Pakistan in light of this "revelation." Immediately recognizing the unfolding implications, China rushed to Islamabad's defense. China has called for support from the international community for Pakistan and stated, "China also suffers from terrorism. Some terrorist forces are engaged in a great many violent, terrorist activities for the purpose of splitting China, and seriously threaten China’s national security, and regional peace and security." China did not state specifically who these "terrorist forces" were, but these comments - indeed this entire confrontation between United States, Pakistan, and China - comes just weeks after China openly accused the West of interfering in its internal affairs. After an attempted color revolution feeding off the current US-funded "Arab Spring," an April 2011 Reuters report, "China crackdown driven by fears of a broad conspiracy," stated that "Chinese leaders believe domestic foes, their foreign backers and Western governments are scheming to undermine and ultimately topple the Communist Party. Recent speeches and articles from security officials echo with warnings of subversive plots backed by Western "anti-China" forces." 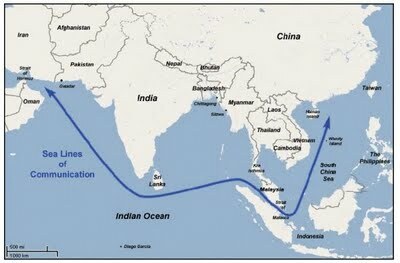 A map from the SSI report "String of Pearls" regarding the containment of China. Pakistan is included, along with Bangladesh, Myanmar,Thailand, Vietnam and the South China Sea. The worst case-scenarios discussed regarding China's containment are now playing out. The evidence is overwhelming that the current "Arab Spring," the subsequent foreign-funded revolutions simmering in Eastern Europe and Southeast Asia, and now the recent row with Pakistan are targeting Moscow and Beijing directly. The threat of destabilization is meant to force concessions, create tension within target nations, and eventually effect regime change favorable towards the goal of Western military and economic hegemony. This is explicitly expressed in Brookings' "Which Path to Persia?" report in regards to Iran and the Middle East, and is reiterated in the Strategic Studies Institute's report "String of Pearls: Meeting the Challenge of China's Rising Power across the Asian Littoral." What will most likely unfold next is a series of attempts to leverage concessions from Pakistan, further isolate nationalist elements, and reestablish control over Pakistan and Afghanistan. China, Pakistan, and the corporate-owned Western media all seem to agree that an attempt to create political upheaval, including a color revolution-style campaign against Islamabad is imminent. Coupled with plans openly articulated by the Center for International Policy to arm separatist insurgents in Pakistan's Baluchistan region, and consistent attempts to drive a wedge between the government and the ISI, we see all the necessary ingredients for a "Which Path to Persia?" style intervention in Pakistan. 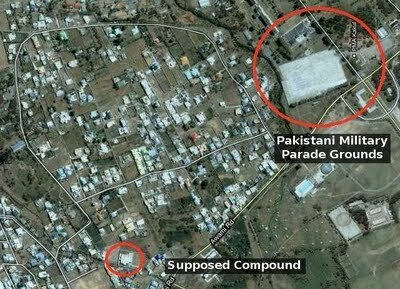 While the West insists war with Pakistan is untenable, one would have thought framing Pakistan with one of the most ridiculous hoaxes in recent history - claiming to find Bin Laden on the doorstep of Pakistan's military academy - was equally untenable. With notorious globalist rags like the Economist attempting to tell us that the collapsing dollar is merely an adjustment between trade imbalances, and as America continues to hit impasses both politically and stragetically with a growing number of nations, we are confronted with an unprecedented psychosis across Western leadership, the corporate-owned media, and the general public itself. There is no resolution for the West's decline as long as those that have brought it upon us remain firmly in control. Likewise we must be vigilant against pretenders and false reformers, especially out of the military-industrial complex - for example, life-long globalist servants like General David Petraeus who might attempt to "save us" from our "flawed civilian leadership." We must commit ourselves as individuals and as local communities to the restoration of the US Constitution at a local level, seize back individual and local sovereignty, and reject entirely the proven failure that is globalization. The stronger the central United States government seems to become, the more precarious America's existence as a sovereign and free nation is. While deciphering the intentions and designs of our "leadership" is difficult and finding voices at a national level we can trust nearly impossible, we can easily discern on a local level whether we are moving towards or away from freedom and independence. It is important to stay informed globally, but more important to become active locally.